How do I setup and upload my PDF file? How long will it take for my book to be approved? How will my book be distributed? How do I make money from reads? Can I set my prices for my books? Do I need an ISBN number for my book? Do I need a publisher to add my books? Can I add a book in different languages? How do I make my book an Audio book? 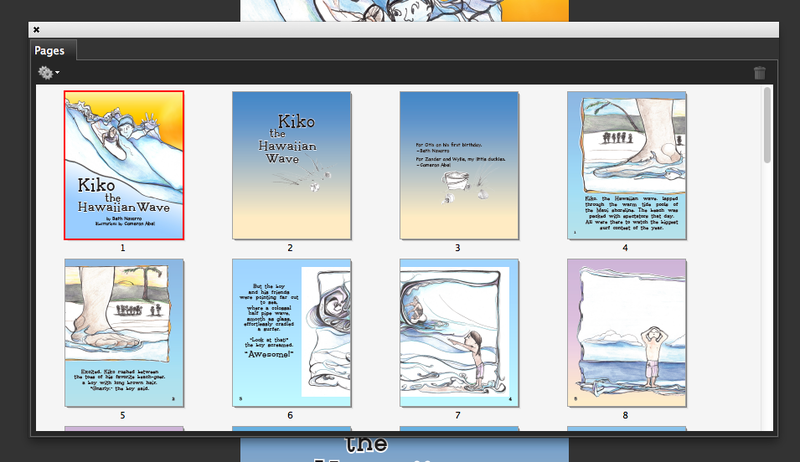 My book is in multiple PDF's. How do I combine? Who can read the full version of my books? How many pages are allowed to be seen for free? How is the revenue share distribution calculated? What is a unique read? I'm reading my book, but I don't see the reads increasing? Can people download or print my books? Can I provide a link for readers to buy a physical copy of my books? Do I need to give exclusive rights to MagicBlox? How long does it take to upload my book? What are the age limits for MagicBlox books? My publisher owns the rights to my book. Can I still upload it? How do I create my own Publisher profile page to showcase my company? Who receives the revenue share for my books? What kind of reporting is offered? How do I write a blog post or promote a book or event? What are the minimum and maximum pages for a book? Is there site wide licensing for my school or library? How can I use MagicBlox to raise money for my school or library? Can I resell MagicBlox accounts? How is my book being distributed? What are the benefits of adding my books to this library? How much does it cost to add my books? Will I be able to cancel or get a refund if I'm not satisified? Can I print the list of books my child has read? What is the age range for the library? How do I choose a book to read for the month? What is the difference between Preview and Read Me? Can I download or print the books we choose? Are the books safe for my children to read? Where do these books come from? If not already part of the PDF file, insert any spacer pages to ensure proper page alignment when displayed in Full Spread view (see below). You should setup your PDF as if you were sending a single file to the printer. 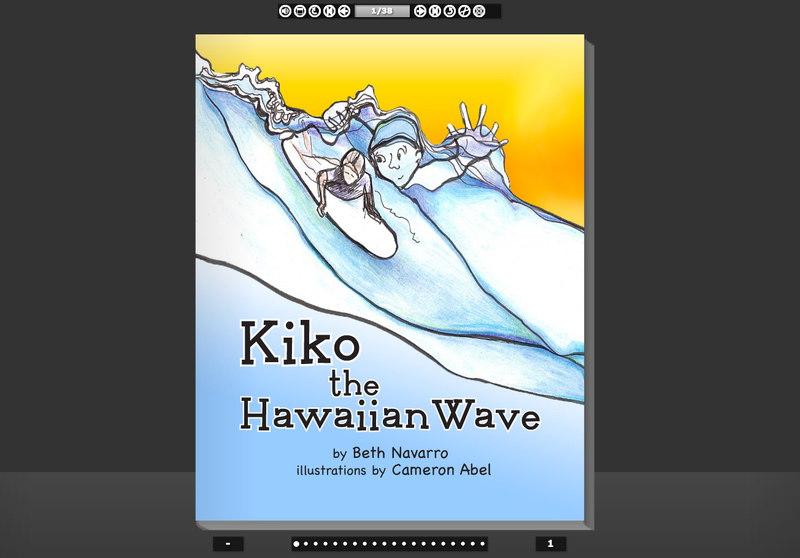 Use the Two-Up display in Adobe Acrobat to test how your book will work in our reader. Once you have your PDF file into the correct format, follow the steps below to add it to MagicBlox. 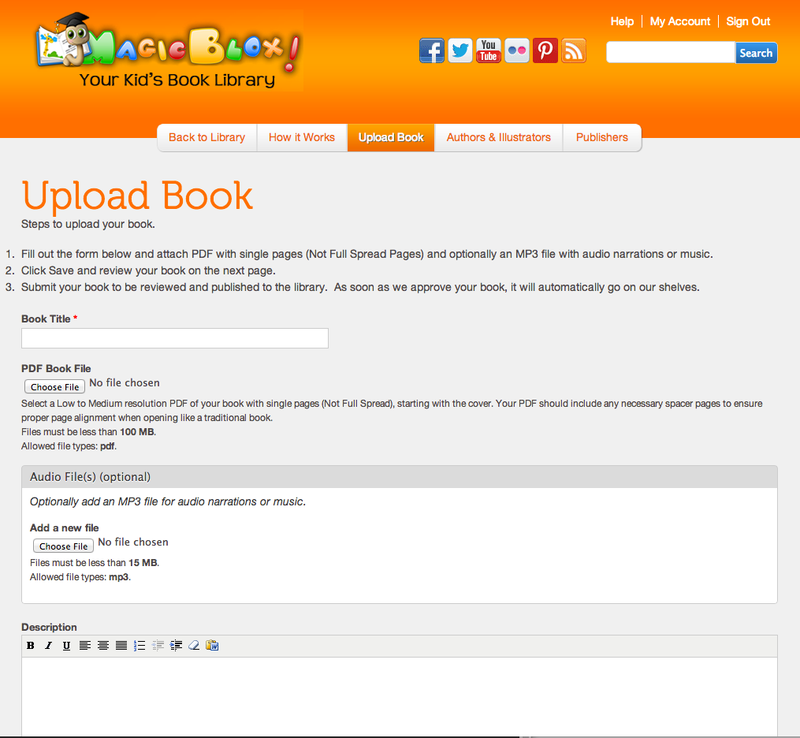 Click on the Blue Upload a Book button or Upload button under the My Books tab within your My Account page. Note on Publisher (You may link your book to a specific publisher. If your publisher doesn't exist in our system already, you may create it, but you will need the publisher logo, description, web site URL, and of course name. Just click Add Publisher next to the field to create it. Ideally, the person creating the publisher should be a representative or have approval to create it. You may still create your book without referencing the publisher if you choose. It can always be added later. Click Save to submit your book for review. You will recieve a confirmation email that your book has been submitted and we will review it. Once we've reviewed and approved your book, we will publish it to the library where our paying members can begin reading it. You will be alerted by email once this step has taken place. Here is a short video that explains the whole process. Once you submit your book for review, it usually takes us no more than about 24 - 48 hours to review it and approve it. 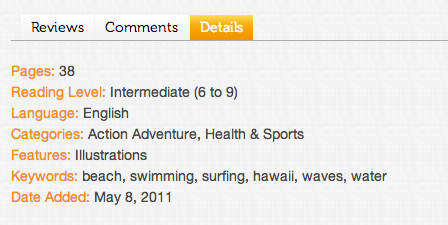 Step 2 - Select the dates you want to view by entering start & end dates and click Apply. 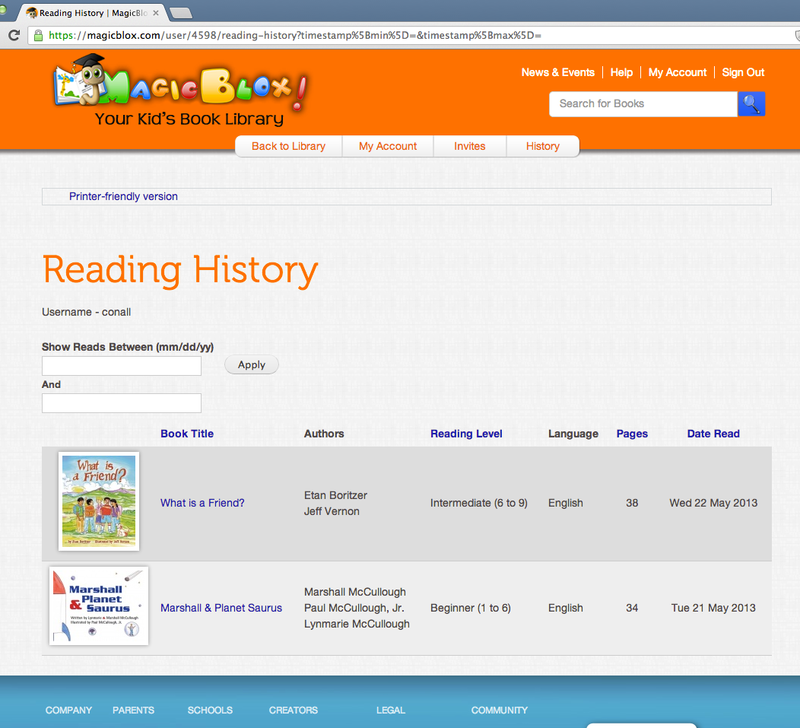 Step 3 - Click the Printer Friendly Version link at the top of the page and Print your Reading History. All books are available on our web site and in our native apps (currently Android only), and through any application or distribution partners who are paying us to use our content via a paid license. All reads will be recorded against your book and you will earn credit towards your monthly earnings. Every month we take 50% of all our revenue and put it into a creator pool to be distributed out across all the books. All unique reads are added up and each book is given a percentage of the creator revenue share based on the perdcentage of total unique reads their book generated. Depending on the reading performance of your book, you will earn a percentage of that revenue share. Example. If your book generates 10% of the total unique reads in a month, your book will earn 10% of the creator revenue share. Over time, we have seen the revenue per read increase and we don't see any reason for that to change. It's a unique royalty model, but one we think will be successful. Since we don't sell books, you do not need to set a price. We do allow creators to provide a link where our readers can purchase a copy of your book, which enables a Buy button on your book details page, but we do not get involved in that transaction. We simply redirect our readers to that link. We allow creators to choose 2 ways to get paid, by PayPal or by Check. When you join the MagicBlox creator community, you can choose your payment method in your account profile. If you choose to be paid by Check, we will issue payments on a quarterly basis, once you've cleared $50 of earnings. You must add your payment mailing address that we can use to send your check to, and it's your responsibility to ensure this address is up to date. We will process all quarterly payments within 45 calendar days after the end of each quarter, and pay all creators with earnings of more than $50 owed. If you choose to be paid by PayPal, we will issue payments on a monthly basis, once you've cleared $10 of earnings. We will process all monthly payments within 31 calendar days after each month and pay all creators with earnings of more than $10. All earnings will be rolled over from month to month until the minimum payout amount is reached. No. You do not need an ISBN number. However, if you have one, please add it to your book to help with search engine discovery and help our readers find your book in other places such as physical libraries and stores. We love books that have gone through the publishing process, but this is the internet, and pretty much anything goes. We do not require your books be published first. However, we will review it for quality appropriateness before making it available to our readers. Absolutely. We currently have books in English, Spanish, French and Italian, so if you want to add a book in any other language, we highly encourage it. We have readers from around the world who appreciate a diverse selection. You'll need to contact us the language you want to add, so we can add it to the Language drop down list when creating your book. You will be able to make your book an audio book at any time, either during upload or in the future as a revision to your book. All you need is a single MP3 file that has you or someone else reading your book. Be sure to create about 3 second time gaps in between each page to make it easier to tag page turns. Once you add your MP3 file to your book, you will have 2 options, Connected Audio or Disconnected Audio. This is when you want to create a follow along reading experience, so that when the reader is alerted to turn the page at the right time. This is great for follow along audio narrations. You will be able to select the exact point in time for each page turn that will allow our system to play a default page turning cue, "ding". You will not need to add that to your audio file. If a user jumps pages, the audio will begin playing from that page. This is when you want to handle the entire follow along audio narration yourself (although jumping out pages will not bring the audio with it), or if you want to add sing along music. If a user jumps pages, the audio will NOT begin playing from that page. They would have to skip the audio ahead as well. You can use Adobe Acrobat Pro or other PDF stiching tools to combine multiple PDF's into a single file. You would want to do this if your publisher or designer gave you multiple files for your book. If possible, try to get a single file from them, as they can probably combine the pages for you very quickly. If you still have trouble and don't have resources to figure this out, please contact us and we can try and help you with it. 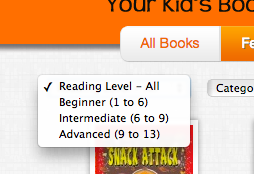 Only registered users who have Ladybug, Bookworm or Butterfly Access Passes can read the full versions of your book. The Ladybug Access Pass allows a single user to pick only 1 book per month for free as a promotional tool, and the Bookworm and Butterfly passes are paid access for 5 books and unlimited access, respectively. All reads from all registered users will be counted towards your reading performance, so don't worry about the Ladybug users. This is a marketing strategy to encourage users to signup. We know that not everyone is willing to pay for an Access Pass right away, but we dont' want to lose them, so we need a way to allow them to register and still find value in our site. In order to give our readers and potential subscribers a glimpse into your books to make their purchasing decision, we are giving everyone access up to 8 page turns before forcing them to sign in..
Our revenue share model is unique in that we give 50% of all revenue generated back to the creator community. Once that revenue is split out, we then divide it across all the books based on reading performance every month. If your book generates 10% of the total Unique Reads for a given month, then your book earns 10% of the creator community portion of the revenue. Over time, recurring monthly revenue should outpace total reads, which will drive up the revenue/read value for your books. Unique reads are what we use to evenly balance the reading performance. 1 Unique Read is counted when a user reads a single book on a one day. The user can read the same book as many times as they want on the same day, but only 1 Unique Read will be counted. This is done to help prevent any mis-use of our revenue share model and helps to evenly balance reading performance numbers. As the owner of your book, we do NOT count your reads, unique reads or total reads. We also skip any reads from our system admins as well. This is done to prevent any fraudulent use of our revenue share model. We want to ensure paying users are reading our books. However, you are allowed to read your own books in full as much as you want to check on them, or just use the service for your own benefit, such as school presentations or library readings. Nobody is allowed to download or print any of our books. It is not possible with our Flash based reader. Our tablet app will allow our paid readers to be able to download a secure version to their tablet device, but it will NOT be accessible outside of our app and will be deleted upon expiration or removal of the app. Yes. This is one of the many benefits of adding your book to our library. You can provide a link to anywhere on the web where our readers can find a pysical copy of your book and we do NOT get involved in that transaction, and do NOT require any kind of royalty or revenue share from you. It is a great source for backlinking to your own web site or blog, or driving additional Amazon sales. 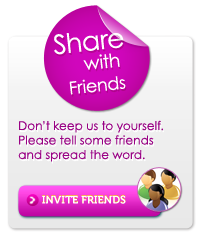 Think of our site as a free marketing service, working for you. No. We encourage all of our authors and publishers to cast a large net and get their books marketed and distributed as far as possible. Depending on the size of your PDF file and network bandwidth, it can take as little as few seconds or a few minutes. Out of all the books we've uploaded so far, the most time we've had to wait for any one book, was about 1 minute, and that was due to slow upload bandwidth. At the moment, we are focused on provididing reading material to parents, schools with kids between 1 and 13 years old. Unfortunately, no. The only person permitted to upload content is the person who owns the digital distribution rights for the content. However, please share our site with your publisher, because there are extra benefits that publishers get when adding content to our site, such as their own Publishers showcase page. 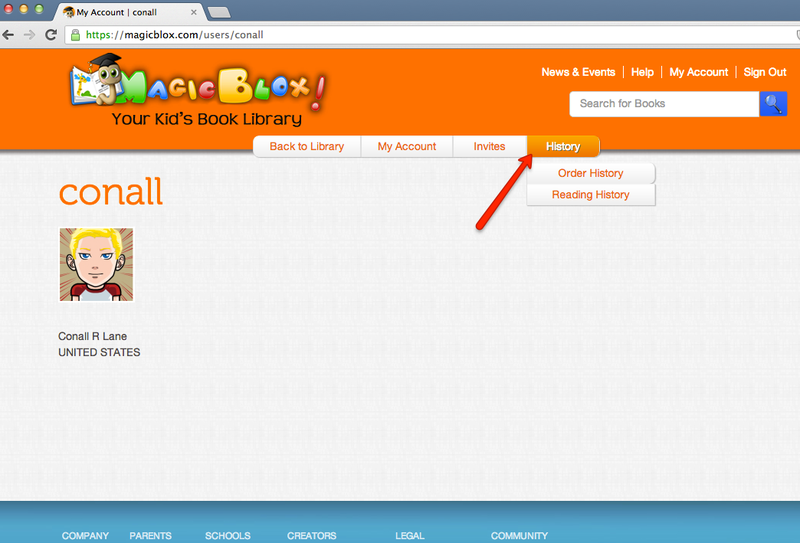 Create your MagicBlox account and join the creator community by checking the box on the signup form. All creators have permissions to create new publishers if they wish. 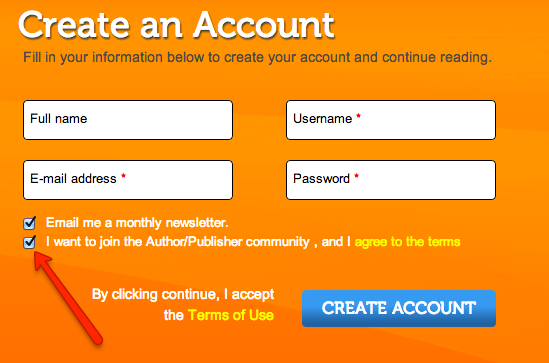 Fom the Publishers Page, you will see an option on the right side to "Add a Publisher." Just click that and fill out the form. You will need the Company Name, Description, Web Site URL, and Logo. The person who receives the revenue share for your books is the person listed under Author Payment Information in your My Account area. Be sure to choose either Monthly or Quarterly option and enter the required payment details in order to get paid properly. Within your account profile, you will have a My Book and My Earnings tab, which will show you all reading performance and earnings for your books. Additionally, we will be sending out a PDF file with an overview of all reading performance, earnings, and payment distribution information on a monthly basis via email. All creators are encouraged to write their own blog posts and showcase their work. The more posts we have, the more search engine exposure we'll have, and easier it will be for new users to find our site. Additionally, you will be able to get recognition and exposure for your work as well. Once you are logged in as a creator, visit the News & Events page, and click Create New Blog Entry, and start writing. You will need to provide at least one image with every blog post. Feel free to talk about events you have upcoming, new book launches, writing inspirations, or any other reading or writing related topic you feel is relavant. We really don't have any minimum's or maximum's, but you should know that we are allowing the first 8 pages of any book to be seen by anyone, so if your book is less than 8 pages, it will be entierly open to anyone who wants to check it out. Yes. We are taking several digital security measures to protect your work. Our file system is unaccessible by anyone except our system admins, our servers are in a PCI compliant data center. All of our reader pages are encrypted and verified by Symantec Verisign SSL certificate, we only allow paying, verified members to access full versions of your books, and nobody is permitted to download or print any of your pages from your books. Additionally, we are also blocking anyone who attempts to create any fruadulent or spam accounts, and limiting how many accounts can be created and accessed from the same device. Yes. We have a special pricing program for schools and libraries interested in using MagicBlox for your classes. Contact us for more information. Our partners are vital to us, and we also know how important extra money can be for your organization. Signup for our fundraising program and we will share a percentage of every Access Pass sold under your unique organization fundraising code. Simply hand that code out to your parents and tell them about this great reading resource, and when they signup, you will get a return every month they stay active. it's a great source of recurring revenue for your organization, and an excellent extracuricular reading resource for your students. Yes. If you have a valid business, where you require kids books for your users, you can license our content and use our REST API to integrate our content into your site or application. Contact us for wholesale pricing information. We have a full REST API that will enable you to access our books, the metadata for our books, and track users and read data against our servers. Contact us for more details. We will generate the API keys for you at this point, so contact us if you are interested in integrating with our platform. As soon as we approve your book to go live on our site, it will instantly be available on our web site, our tablet apps, and any distribution partners who are reselling access to our site. 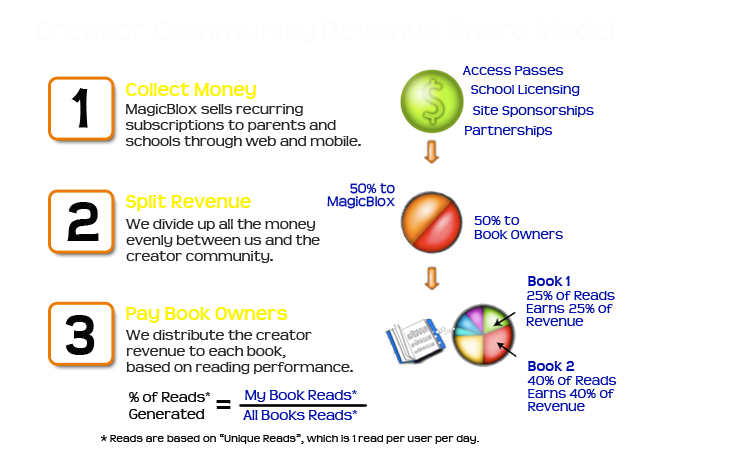 No matter how your book is read, all reads will be calculated and tracked centrally, and you will receive the benefit. By adding your book to our library, you get tremendous upside value, such as FREE Viral Marketing, Digital Distribution, Reviews & Feedback, Instant Global Exposure, and you earn Money when it gets read. It is also a great way to get discovered by not only new readers, but potential publishers who might be interested in your work. There really is NO downside to adding your books to our library. It's Secure, Non-Exclusive, FREE and you receive all these great benefits. FREE Viral Marketing - Not only will you benefit from our monthly marketing budget to bring users to our site, but your book will also be available with social media sharing and digital search engine optimization technologies that will allow your book to be shared and discovered through the world wide web. Readers can create Facebook comments, write reviews, Tweet your book, share on Pinterest, LinkedIn, Instagram, and all other social media tools available today. Additionally, your book will benefit from other authors & publishers sharing their books, through our advanced recommendation engine that suggests relevant titles that are similar to what the reader is interested in. FREE Digital Distribution - As soon as we approve your book, it becomes available on our web site, and mobile tablet apps, as well as any distribution partners who are reselling access to our platform. If you wanted to create this on your own for a single book, it could cost thousands of dollars to create a single app or web site for your books. We have done that for you. Reviews & Feedback - Hear back directly from our readers and learn what works and what doesn't with your work. 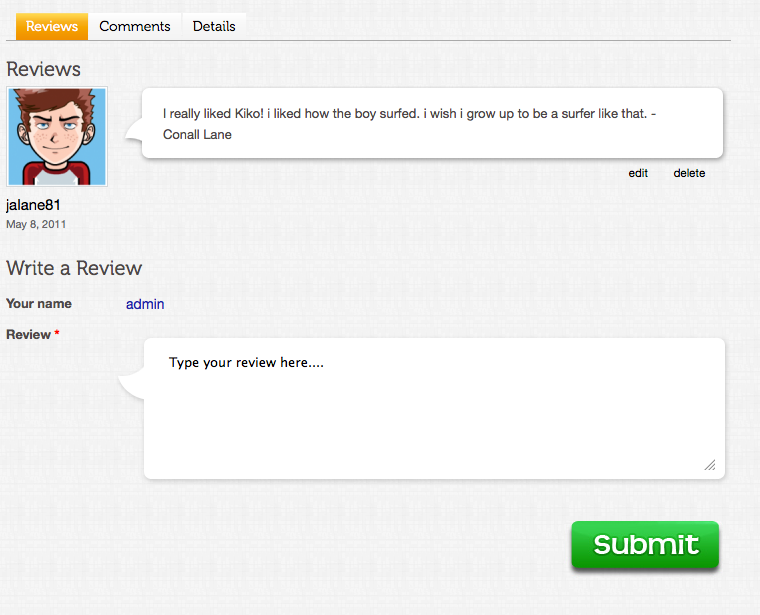 See real time ratings, reviews and comments about your books. 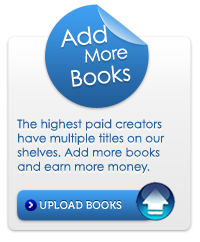 Earn Money - Every time your book is read, you earn a portion of the monthly revenue that we generate. Over time, we believe the revenue / read will only go up, which will create an opportunity to make more per read than you will per sale. Buy Book Button - Add a link to ANYWHERE on the web where our readers can find a physical copy of your book for sale (Amazon, B&N, your website, etc. ), and a Buy button will show up on your book details page that will take our users to that location. Great for your website SEO rankings and generate additional sales from passers by who find your book on our site. Interactive Audio Books - Quickly and easily turn all of your books into interactive audio books by uploading a single MP3 audio file with sounds, music, and/or narrations. Our readers love audio books, and believe it or not, your voice will probably be just fine, but if you choose, professional voice talent would be good too. It doesn't cost you anything to add your books to our library. We are a free Marketing, Distribution and Discovery service for authors and publishers, and in fact... we even pay you to add your books. Yes. You may cancel or downgrade at anytime. 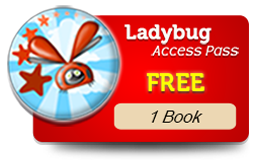 If you have a premium Access Pass, and no longer wish to pay, you will be give a Free Lady Bug membership, so you can continue to read at least 1 new book per month. If you are less than half way through your membership period, you may get a refund for the unused portion of your membership. If you cancel your paid membership more than half way through the membership period, you will not receive a refund for that period, but all future payments will be cancelled. Contact Support if you wish to cancel your membership. Yes. Under your account profile, there is a tab with reading history on it. You may print or email that page at any time. Attach it to your child's weekly reading log for school. We have books good for Beginner, Intermediate and Advanced readers, which ranges from Pre-K to 13 years old. 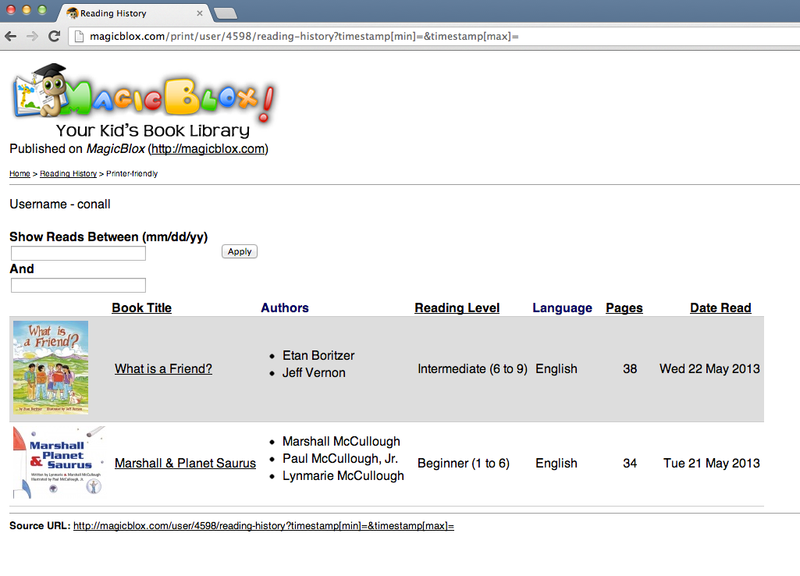 You can filter the library based on those ranges and you can see the age range on the Details tab for each book. Preview any book you want to read for the month and when you get to page 8, you will be prompted to choose it for the month. 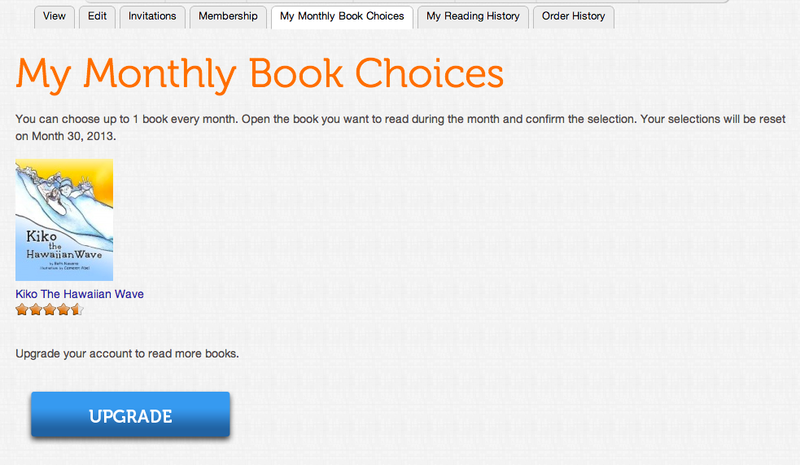 Use the "Select" button to add it to your monthly reading choices. Your choices will get reset every month on the day you created your account. If you created your acocunt on March 14th, your choices will get reset on the 14th of every month. 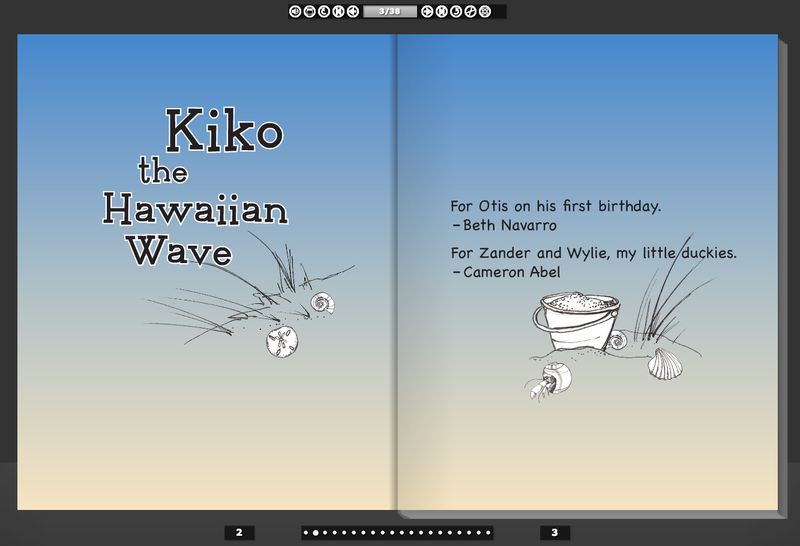 Users who don't have access to the full version of a book get the "Preview" button, which allows you to see the first 8 pages of any book. 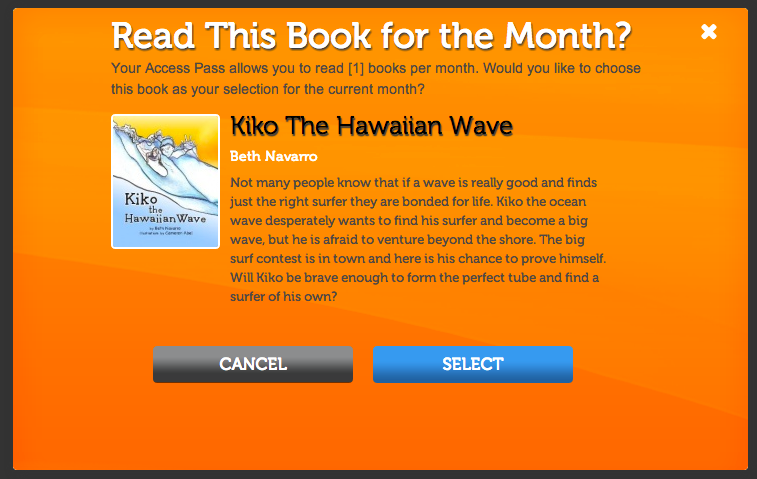 Users who have already selected the book as one of their monthly choices or have unlimited access will see the "Read Me" button, which allows you to open the full version of the book. With our Free Lady Bug Access Pass you are allowed to read 1 book every month. We also offer monthly and yearly premium options that give you unlimited access to all books. Every Access Pass gives you all features such as audio. No. Our mission is to make it easier for you and your kids to take a risk on new books without committing a large purchase price. Our membership prices are structured to allow you to read the books and not own them, so we do not allow printing or downloading. On our tablet apps, you may take a few books offline to bring with you, but they remain locked within our application and expire when your membership expires. Yes. Every book, no matter who uploads it or what they upload, gets reviewed by our team before it's made available to your children. We will approve books appropriate for kids up to 13 years old. MagicBlox partners with authors and publishers from around the world. We support independent, self-published authors as well as traditional book publishers looking for another way to get their books into your hands. Part of the revenue we collect from access pass memberships is used to pay them for their work. Be assured, that we do review every page of every book before it can go onto our shelves, and we will not publish anything innappropriate for your children. 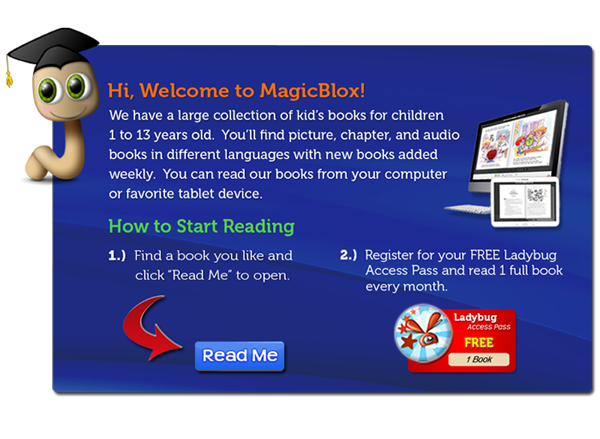 MagicBlox is Free to read 1 book per month with our Ladybug Access Pass. Every 30 days, your book choice gets cleared and you can choose a new book. We also have premium options that give you unlimited access to all of our books for $4.99 per month or $38 per year. The best option is our Butterfly Access Pass for $38, which saves you 36% per month. Check out our pricing page for full details. At MagicBlox, you don't actually buy digital books. You buy Access Passes for a very small monthly or yearly fee and you can read the books online or on your tablet devices. If you want to purchase a physical copy of the book, some of our authors & publishers provide links to their own web sites or distribution partners where you can purchase a paper copy. Clicking the "Buy" button on any book will take you to the link they provide.